★ LOOGAROO ★: MR.MITCHELL IS COOL - YOU CAN BE TOO! MR.MITCHELL IS COOL - YOU CAN BE TOO! Check out "The Pops" of Fatkat's very own Gwen Mitchell. 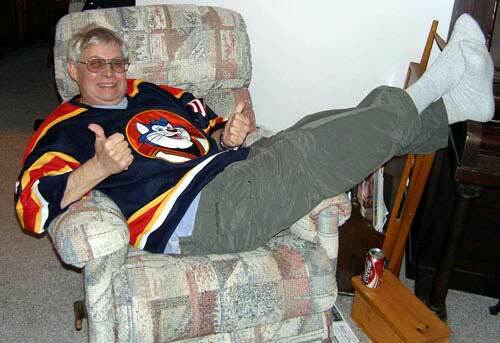 He's kicking it in his fancy Fatkat Hockey Jersey watching Canada's favorite game. You wish you had one too... I know...well order one!! Send $100.00 CDN - your size, colour (Red, white or blue) the name you want on the back along with the number you want on the sleeves and back. Don't forget your mailing address or we'll keep it and play sweaty sports in it. "Order me a damn Jersey!" or an email money transfer to info@fatkatanimation.com with your above info in the comment box.